The BSBI Annual General Meeting (AGM) takes place every year during the Annual Exhibition Meeting. 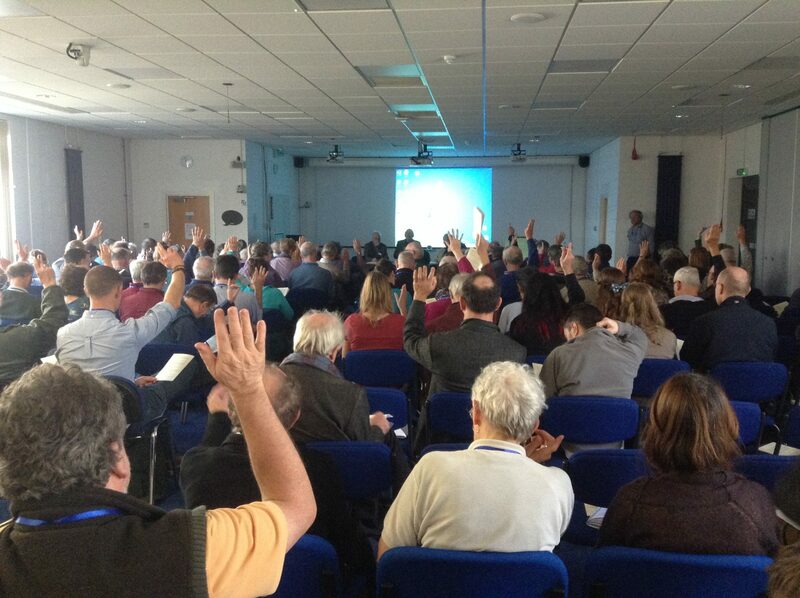 We set aside up to an hour for BSBI members to vote on items relating to the society’s governance. Our 2018 AGM will take place between 2-2.45 pm in the Lecture Theatre, Faculty of Health & Social Science, Edge Hill University, Ormskirk, Lancs. Any BSBI member can raise a matter for discussion by contacting our Company Secretary Clive Lovatt in advance of the AGM. Click on the link to see the final agenda for the 2018 AGM. This replaces the draft agenda, which we posted on this website in September and which can still be seen here. BSBI's most recent Annual Reports and Accounts, and our Annual Review, are available to view or download here. They are referred to in the AGM 2018 agenda and members will be invited to take note of the 31 March 2018 Annual Review and to adopt the 31 March 2018 Annual Report and Accounts. If you are not a BSBI member, you can choose to stay in the Lecture Theatre during the AGM and listen to our discussions (although you won't be able to vote) or you can opt to visit the exhibition hall instead. Don't forget, if you are a BSBI member then the AGM is your chance to have your say and participate in how the society is governed. Paper copies of the 2018 AGM agenda and the draft minutes from the 2017 AGM will be made available at the AGM but we also encourage members to take a look in advance at the electronic copies available for download from this page. Our 2017 AGM took place between 2-3pm in the Flett Lecture Theatre, Natural History Museum, London. You can download the draft minutes here. Members will be asked at the 2018 AGM if they approve these minutes and a vote will be taken. The 2017 agenda is still available here and includes information on retirements, and candidates for election as officers and Honorary Members. In 2016, the AGM was held at the Centre for Ecology & Hydrology, Wallingford, Oxfordshire. You can see the final minutes of the 2016 AGM here. The minutes were approved during the 2017 AGM. The approved minutes from the 2015 AGM, held at the Natural History Museum, London, are here. The approved minutes from the 2014 AGM, held at the University of Leicester, are here. Annual Reports and Accounts, and Annual Reviews, from 2015 onwards are available here and archived copies can be downloaded here. These reports are referred to in the AGM agenda and were approved and authorised for issue to members by the Board of Trustees. BSBI members have, at each AGM, noted the Annual Review and voted to adopt the Annual Report and Accounts as a formal record of the society's botanical and financial activities in the previous financial year. During the 2018 AGM, BSBI members will be asked to vote on the nomination of a new President-elect, Lynne Farrell; the election of one new Council member, Max Brown; the re-election of three Council members, Mary Dean, Liz Lavery and John Swindells; and the re-election of four trustees, Paul Bisson, Chris Cheffings, Mick Crawley and Sarah Whild. Paul Bisson has served one term as a BSBI trustee and members are now invited to elect him for a second term. Max Brown is nominated as a Member of BSBI Council, proposed by BSBI member Alex Twyford and seconded by BSBI President Chris Metherell. Max is a postgraduate student at the University of Edinburgh working on hybridisation and speciation in Euphrasia, a post which he took up after graduating from Jesus College Oxford. In between Euphrasia-related field trips and running large-scale growth experiments in the common garden at the Royal Botanic Gardens, Edinburgh, Max maintains a deep interest in entomology. Prior to landing in Edinburgh he spent several months in Sumatra where his work included collecting specimens for the characterisation of a new taxon in the Onthophagus limbatus species group and writing a key to dung beetle species allowed wider teaching of the entomology department there. Max is a rare individual in botanical research these days, a geneticist who is also an expert field botanist who actively teaches plant identification at undergraduate level. Chris Cheffings is Evidence Manager at JNCC, where she has worked since 2002. She is also joint editor (with Lynne Farrell) of The Vascular Plant Red Data List for Great Britain. Chris has served one term on BSBI's Board of Trustees and members are now invited to re-elect her to serve for a second term. Mick Crawley is Professor of Biology at Imperial College London , Chair of BSBI's Science & Research Committee, and is BSBI's County Recorder for Berkshire and also for East Sutherland. He is also the author of Plants of East Sutherland. Mick has served one term as a BSBI trustee and members are now invited to re-elect him for a second term. Mary Dean is a Lecturer in Biology and Associate Researcher at Edge Hill University and has been a regular contributor to the BSBI News & Views blog, where she reports on field meetings she attends or co-leads in Cumbria, from her home patch on the Sefton Coast and also in Easter Ross. Mary has served one term on BSBI Council and members are now invited to re-elect her for a second term. Ian Denholm is the Chair of the Board of Trustees and will be chairing the 2018 AGM. Ian was BSBI President 2013-5, is Chair of BSBI's Meetings & Communications Committee, Editor-in-Chief of New Journal of Botany 2016-7, joint County Recorder for Hertfordshire and a BSBI plant referee. He has served on BSBI's Board of Trustees since 2013. Lynne Farrell has been nominated President-elect, proposed by Chris Metherell and seconded by trustee Chris Cheffings. At the 2018 AGM, the members are invited to elect Lynne Farrell as President-elect. Lynne was born in Manchester, educated in Sale, Cheshire and went to Coleraine University, N. Ireland, graduating with an Hons degree in Biology. Her first job was as a botanical assistant at Monks Wood Research Station, then under the Nature Conservancy, in Huntingdonshire. She continued her professional career working in the Biological Records Centre, then as plant ecologist and heathland specialist for English Nature, followed by various posts in Scottish Natural Heritage until retiring in 2007. She has always been interested in voluntary organisations and has been a member of several Wildlife Trusts and groups. She joined BSBI in 1967 and served as Field Meetings Secretary, Hon. General Secretary, Council member, Chair of Meetings & Communications and Vice-president. Now, Lynne is County Recorder for Mid Ebudes and is a keen sports fan and gardener. She moved to Arnside, Cumbria in 2017 after being based in Cambridgeshire for over 38 years. Liz Lavery is one of three County Recorders for West Perthshire and serves on BSBI Scotland's Outreach Team. She has served one term on BSBI Council and members are now invited to re-elect Liz for a second term. Chris Metherell is President of the BSBI. Chris was BSBI's Hon. General Secretary from 2014 until he was elected President at the 2017 AGM, taking over from John Faulkner. He is also County Recorder for North Northumberland, is a BSBI plant referee, a flag-waver for herbaria and has published a BSBI Handbook for Euphrasia. He served on BSBI's Board of Trustees from 2013 to 2017. John Swindells served as Chairman of the Wild Flower Society until he stood down at the end of 2017; he has served as a member of BSBI Council since 2013 and members are now invited to re-elect John for a further term. Sarah Whild was Senior Lecturer in Plant Ecology at Manchester Metropolitan University and Director of their Biological Recording Programmes until her retirement in 2018. She chaired BSBI's Training & Education Committee from 2005 to 2016 and was responsible (with Sue Townsend) for devising Field Identification Skills Certificates. She has served as a trustee of the Field Studies Council, the National Federation of Biological Recording. Since 2013 she has served on BSBI's Board of Trustees and members are now invited to re-elect her for a further term. Delyth Williams was elected BSBI's Honorary General Secretary by BSBI members at the 2017 AGM, taking over from Chris Metherell. Delyth has been County Recorder for Denbighshire since 2008, has served on BSBI's Committee for Wales since 2003 and has served as a BSBI trustee since 2013. The BSBI aims to be transparent and accountable in its governance - to this end, we have made the minutes of all meetings of our Council, Board of Trustees and committees available to all our members via our Governance website which can also be accessed from our members-only area (passwords required for both). Contact us if you are unsure of your password and please include either your membership number or your postal address. During the 2017 AGM, held on 25th November at the Natural History Museum, London, BSBI members were asked to vote on the nominations of two new Council members: Mark Duffell and Anne Haden; two Honorary Members: Bob Ellis and Trevor James; and five new trustees: John Faulkner, Alastair Fitter, Sandra Knapp, Christopher Miles and Anthony David Thomas. Ian Denholm was BSBI President 2013-5, is Chair of BSBI's Meetings & Communications Committee, Editor-in-Chief of New Journal of Botany since 2016, joint County Recorder for Hertfordshire and a BSBI plant referee. He has served on BSBI's Board of Trustees since 2013. Martin Godfrey is Vice-President and Education Officer of the British Bryological Society, has led field meetings and training workshops for BSBI and is an active volunteer in his local herbarium. He has served on BSBI Council since 2014. Chris Metherell was BSBI's Honorary General Secretary from 2014 until earlier this year, is County Recorder for North Northumberland, is a BSBI plant referee, a flag-waver for herbaria and is writing a BSBI Handbook on Euphrasia. He has served on BSBI's Board of Trustees since 2013. On 25th November 2017, Chris took over from John Faulkner as BSBI President. Matt Parratt has since 1994 been a research scientist at Forest Research, based at Roslin, Scotland. He is a silviculture researcher, botanical tutor and mountain leader. He is one of BSBI's expert plant referees and has served on BSBI's Council since 2015. David Pearman was BSBI President 1995-1998, a stalwart of BSBI's Records & Research Committee, co-author of the New Atlas of the British & Irish Flora (2002), co-author of the Hybrid Flora of the British Isles (2015), author of the forthcoming Discovery of the Native Flora of Britain & Ireland. His many contributions to BSBI were celebrated at 'Pearman Day' held at RBG Kew in 2014. He has served on BSBI's Board of Trustees since 2013. Sarah Whild is Senior Lecturer in Plant Ecology at Manchester Metropolitan University and Director of their Biological Recording Programmes. She chaired BSBI's Training & Education Committee from 2005 to 2016 and was responsible (with Sue Townsend) for devising Field Identification Skills Certificates. She has served as a trustee of the Field Studies Council, the National Federation of Biological Recording and since 2013 she has served on BSBI's Board of Trustees. Delyth Williams has been County Recorder for Denbighshire since 2008, has served on BSBI's Committee for Wales since 2003 and has served as a BSBI trustee since 2013. In 2017, she was appointed BSBI's Honorary General Secretary, taking over from Chris Metherell.